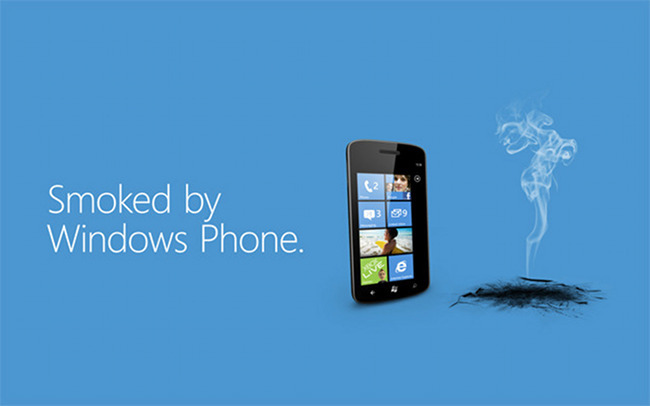 Since CES, Microsoft has been running a campaign to raise awareness for their Windows Phone lineup called “Smoked by Windows Phone.” It is a challenge of sorts that asks you to enter your Android or other phone into a battle with a Windows Phone to see if it can beat it at simple every day tasks. Tasks could be to find directions to a near by 4-star restaurant or snap a picture and upload it to Facebook. Fun, right? Not so much for the owner of a Galaxy Nexus who stopped by his local Microsoft store this weekend to take the challenge. Within the last week, Microsoft upped the bounty for their “Smoked” challenge, offering up a $1000 special edition laptop to those that could beat Windows Phone or the opportunity to trade in your current phone for a Windows Phone should you lose. The owner of Skattertech took his G-Nex in and won, according to his standards, but not so much according to the Microsoft store’s standards. What was his test? Once he got to the front of the line of people taking the challenge, he was asked to power down his phone and then back up again to kill off background tasks. Then the task itself was for him to display weather on his phone from 2 different cities faster than the Windows Phone. Since he had disabled his lockscreen and had two widgets on his home screen showing weather in 2 different cities, all it took was the press of a button and he was done. The Windows Phone user on the other hand had to swipe away a lock screen, causing her to be a split second later than our friend with the Nexus. So he won? Nope. He was told that he lost because the Windows Phone “displays the weather right there,” which I’m not even sure is an actual reason. A manager came over after a handful of questions from our Android friend and was told that he lost because he needed to display weather from 2 different cities in 2 different states, something that he claims was not made clear up front. He was never given his prize. Update: Microsoft is doing the right thing now. Ben Rudolph, who runs the challenge in the video below, announced on Twitter that they will indeed award Skattertech with the $1000 laptop and a Windows Phone. Cheers Robb, Ashot, and everyone else!